In Luke 10, we read the well-known parable of the Good Samaritan. This well-known parable has become a part of our culture, even past presidents have referred to it in speeches. The parable was told by Jesus in response to a challenge, a question posed by an expert in the Mosaic Law. His question was interesting, “Teacher, what shall I do to inherit eternal life?” He was obviously trying to trick Jesus, because he knew exactly the requirements of the law. Jesus answers the question with a question, “What is written in the Law? How do you read it?” (Luke 10:26). Jesus immediately directs the man to an authority that they both can accept, the Law of Moses. The scribe answers Jesus’ question by quoting Deuteronomy 6:5 and Leviticus 19:18. This is the correct answer, but the learned man is not satisfied, he knows that that he is not perfectly loving towards his fellow man, so he is looking for a lower standard. He tries to limit the law’s command by limiting its parameters and asked the question “who is my neighbor?” One of the meanings of the word “neighbor” in the Greek could be translated as someone of the same race or tribe. But this makes the goal attainable, so Jesus tells this parable of the Good Samaritan to correct the false understanding that the scribe had of who his neighbor was. The Parable of the Good Samaritan tells the story of a man traveling from Jerusalem to Jericho, Jesus doesn’t mention anything about the man, we don’t know his nationality or race, and while on the way he is robbed of everything he had, including his clothing, and is beaten to within an inch of his life. Both a priest and a Levite pass by the man and refuse to offer assistance to him. The next person to come by is the Samaritan, the one least likely to have shown compassion for the man, due to the racial prejudice between the Jews and the Samaritans. We do not know if the injured man was a Jew or Gentile, but it made no difference to the Samaritan; he did not consider the man’s race or religion, he only saw a person in need of assistance, and he assists him by going above and beyond what would have been expected. He pays for the man’s care and essentially gave the innkeeper a blank check. He seemed to be very trusting, but I don’t think the lesson is trust, I think the lesson is abundance, he was not concerned because he knew that his supply was from God, and that God never will run out of money. So even if the innkeeper took advantage of him, it would be okay, because it wasn’t his money anyway, it was God’s money and He will pay the bill (see Proverbs 19:17). God’s kingdom is not a kingdom of lack or a miserly mindset, God’s kingdom is a kingdom of excessive abundance, of extravagant generosity, of joyful giving, because that is what our Heavenly father gives to us (see Luke 6:38). Let us be extravagant in our generosity because we serve an extravagant God. The Samaritan saw his neighbor as anyone who was in need, and we are to follow the Samaritan’s example in our own conduct by showing compassion and love for those we encounter in our everyday activities regardless of their race or religion; the criterion is need. However, there is no person on earth who can meet this standard, our desires are mostly selfish. When left to our own, we do the wrong thing, we see the person in need and justify why we don’t need to help them. What about the drug addict, the homeless person or what about the Muslim refugee? One could go on listing examples of modern-day needy people who make us look far worse than priest or the Levite. We don’t need a list of tasks, we need a savior. To inherit eternal life, we must put our faith and trust in Jesus Christ, the risen Lord and allow the Holy Spirit’s transforming power to enable us to love our neighbor. We cannot love our neighbor without the Holy Spirit in us, leading us and giving us the love of God for those around us. If you find it difficult to love that person who annoys you at work, who offends you or who hurt you, you don’t need patience or more strength; you need Jesus Christ in you, transforming you by the power of the Holy Spirit. 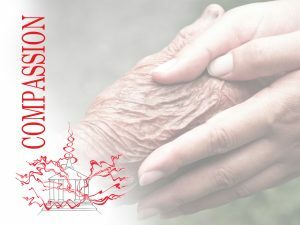 Compassion is a pillar of the church but does not stand alone, there needs to be a strong connection between compassion and mission, between compassion and worship and between compassion and the Word. James chapter 2 explains to us that faith without works is dead; rather we show our faith in God through our works of good deeds. The compassion of the church must always bring glory to the name above all names. Acts of social justice done for the Glory of God are in themselves acts of worship. However, compassion without the foundation of the Word of God lacks true empathy because it lacks true power to change lives. Only the word of God coupled with the revelation of the Holy Spirit has the power to change lives. Just like the work of the church is not done until the Great Commission is completed, so too the opportunities for the church to be a compassionate example of Christ will not go away until Jesus comes again. Let us be a church that proclaims the Gospel loud and clear, intentionally helping those in need with an eternal perspective.